Description: Mr. Lincoln returns home from the market with his two younger boys, Willie and Tad, as Mrs. Lincoln waits at the front door of their house at Eighth and Jackson Streets in January, 1861. 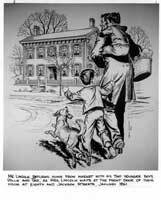 Art depicts Mr. Lincoln carrying one of the boys on his back, while the other one is at his side with the dog. A basket of groceries is under his arm.